specially-roasted bean. You don’t have to be a professionally-trained barista, however, to fully understand how espresso works. There are three parts to the espresso shot: the crema, the body, and the heart. The crema is the light brown, creamy layer floating on top of your espresso shot. It’s naturally very sweet and comes at the end of the pull. The crema creates a full bodied mouthfeel and adds to the aesthetic appeal of this Italian beverage. The body is found in the middle of a shot and is very dark brown, yet slightly lighter than the almost black heart which rests on the bottom. Both the body and the heart are where most of the suspended and dissolved coffee lies. 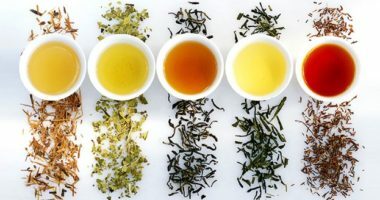 They are bitter, but if brewed correctly, can be surprisingly light and sweet. Espresso is a highly concentrated beverage, and as such is very thick. Not like a milkshake, but with lots of suspended solids and naturally-occurring oils and tannins. It mixes very well with dairy milk. Milk is naturally sweet as well, and when heated, the natural sweetness is more apparent. When espresso is steamed, or heated and induced with air, it expands and thickens, creating two distinct parts: foamed milk and steamed milk. One thing that even most modern baristas don’t even understand is that the Italians intended for traditional espresso and milk-based drinks (lattes, cappuccinos, macchiatos, etc.) to be created by frothing/foaming the milk according to which kind of drink you are creating, stirring the milk, then pouring it over the espresso to create one smooth and well-mixed beverage. Today, baristas are either not trained properly or cut corners by using a large, broad spoon to hold back the foamed milk (which floats on the top), allowing the steamed milk onto the beverage first, and topping with foamed milk by spooning the froth onto the top of the beverage. Not only is this visually unappealing, covering up all of the lovely dark espresso crema, but it also does not blend the beverage adequately. All of the espresso remains on the bottom and the drink does not taste as it was intended to taste. Another common misconception: many people think that coffee bean blends labelled “Espresso Roast” or “Espresso Beans” are the only thing that you need to make espresso coffee. This misconception couldn’t be farther from the truth. Espresso beans are full-bodied dark roasted coffee beans. 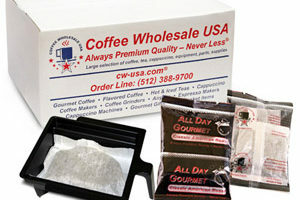 You can use them in an espresso machine as well as at home in your drip brewer. Espresso coffee is a brewing method created with an expensive, specially-manufactured espresso machine. The machine uses finely ground coffee which can actually be made from any type of blend of roasted coffee beans. Typically, these machines are way too expensive for anyone to have in their homes, and are only found in commercial restaurants and cafes. To make espresso, baristas warm up the espresso machine, which is simply a device that pushes very hot water under very high pressure through finely ground coffee, yielding the concentrated coffee beverage we know and love. Next, coffee beans are ground finely in a grinder. Commercial grinders as well as some home grinders allow you to adjust the grind setting. Coffee is poured into a portafilter or small basket which holds the coffee and tamped down with a round stamp-like device. If coffee is ground too finely or the grounds are tamped down too hard, the machine cannot properly push water through the ground beans and the end product will taste burnt. If the coffee is too coarse or the grounds are not tamped down hard enough, the end product will be watery, unflavorful, and crema won’t be produced. Clearly, there’s a little bit of trial and error that every barista has to go through to get the feel of it. 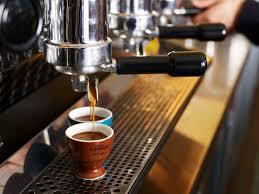 Shots are poured, in a semi-automatic espresso machine, by entering the portafilter into it’s holder and flipping the switch which turns on the water. One shot is poured in 18-23 seconds, depending on that machine’s specific settings. Voila! One perfect shot of espresso is the end result. 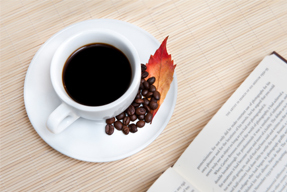 Now that you are on your way to becoming a coffee connoisseur, we want to know: what’s your favorite espresso-based beverage? Can you stomach plain espresso, or do you need to sweeten it with sugar or steamed milk?